Do you advertise with video? Wondering whether YouTube ads are worth your time and money? In this article, you’ll find new research that reveals how consumers respond to ads on YouTube and insights about how marketers plan to adjust their YouTube ad spend. 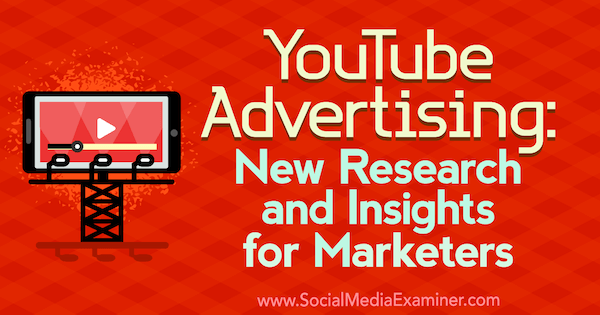 YouTube Advertising: New Research and Insights for Marketers by Michelle Krasniak on Social Media Examiner. Not too long ago, YouTube was the undisputed king of online video. Founded in February 2005, YouTube’s sole focus has always been video, thereby allowing it to rise (and stay) at the top of the heap. Two years after YouTube launched, it rolled out the advertising feature. Now, a decade later, advertisers can choose from among six different ad formats. For better or worse, users watching videos on YouTube expect some kind of advertising. It has become the norm. 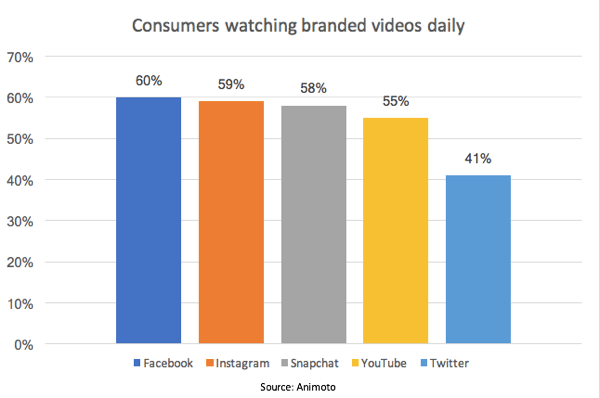 On the other hand, Facebook went mainstream in 2006 and according to Animoto’s The State of Social Video: Marketing in a Video-First World study of 1,000 consumers and 500 marketers, 60% of consumers watch branded video content daily on Facebook and 55% report watching it on YouTube. Not surprisingly, 59% say they watch branded videos on Instagram, which is pretty much an extension of Facebook at this point. 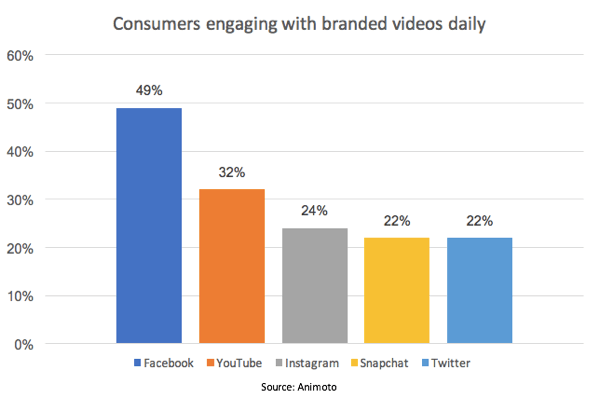 According to an Animoto study, 55% of consumers watch branded videos daily on YouTube. However, engagement is a different story. Facebook still leads the pack when it comes to the number of consumers who engage with video content (49%). YouTube comes in second place with 32% of the respondents saying they engage with branded video content. These numbers are interesting because Mark Zuckerberg has forbidden pre-roll ads. From the start, advertisers were left with few options to monetize their videos on Facebook, leaving many frustrated with the platform. Facebook leads the pack in percentage of consumers who engage with branded videos. Although YouTube offers a mid-roll advertising option, it was Facebook’s decision to start doing the same thing that left consumers up in arms. A business has a responsibility to its shareholders to make money; however, it’s a delicate balance when such decisions affect the experience of the rest of the stakeholders. The fact of the matter is, consumers generally aren’t fans of change and when it involves something like their beloved Facebook, change becomes an even bigger issue. But as with past platform changes, Facebook will undoubtedly work out the kinks so that advertisers are happy and still spend their ad dollars while consumers begrudgingly come to accept a new normal. Social Media Marketing 101 tells you to figure out your target audience and aim your marketing efforts at them. But what if not targeting your target audience worked as well and was actually more cost-effective? According to Strike Social’s 2017 YouTube Advertising Benchmark Report, there is a group of YouTube content consumers that the report refers to as “the unknowns.” The group is so-named because demographic information about people in this group is not known. On the surface, this lack of data may seem like a bad thing for advertisers. However, Strike Social’s data shows the individuals whose ages are unknown have a view rate (VR) of 29.5% (6.5% higher than average) and a cost per view (CPV) rate of $0.034 (nearly 23% lower than average). When the gender of the viewer is unknown, the VR dips slightly to 28% and the CPV climbs a bit to $0.039. 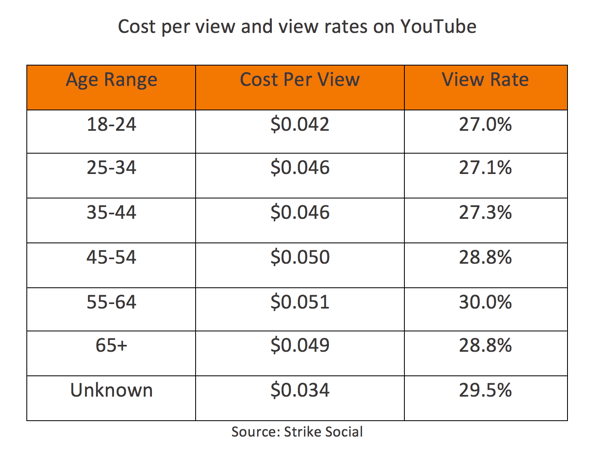 Strike Social’s study reveals that the “unknown” age group has a higher-than-average YouTube view rate and a significantly lower-than-average cost per view. This approach is perfect for products or services that are gender- and/or age-neutral and have universal appeal. While other advertisers battle it out for ad space and pay the higher prices, consider targeting the unknowns to see how much bang for your buck you get. If your VR is considerably lower than 28%, it’s probably worth a try to eliminate age and gender from your audience targeting. Just be sure to monitor your ROI as you typically would and give your ads enough time to run before making decisions based on the results. Data collected by Strike Social shows that a person’s interests give some insight into their receptiveness to ads on YouTube. For example, Strike Social found that thrill-seekers have high view rates in several states. Individuals in Nevada who identify as thrill-seekers had an average VR of 32.3%, while Idaho’s came in at 31.8%, and Minnesota and Nebraska tied for third place with a 31.6% VR. Another interest category with a high VR percentage was foodies. If you’re a cooking enthusiast living in Washington, you have a whopping average VR of 70.8%, with Arkansas and Connecticut coming in at 68.3% and 67.6% respectively. But how many people are laser-focused on only one interest? Have you considered how these interests with high VR percentages might overlap? For instance, there’s a good chance that someone who is big into health and fitness is also a foodie, but they could also be a thrill-seeker, depending on what kind of health and fitness activities they prefer. Also, pay attention to what device people use when they watch ads. Some people respond to any ad as long as it’s served on mobile. In fact, more than half of YouTube video views come from mobile users. Nevada, Idaho, Minnesota, and Nebraska have the highest YouTube view rates among thrill-seekers. Don’t be afraid to target audiences whose interests don’t necessarily perfectly align with your buyer persona. Think outside the box and consider the ripple effect. Although you may not want to completely change up your targeting, you should do some A/B testing of these different segments so you get an apples-to-apples comparison about how this new group responds to your ads. You never know; the simple fact that they’re seeing an ad that is so different from those they’re usually served may be enough to get those VR percentages up. Remember the issues with Facebook’s video viewing metrics? In short, over a two-year period, Facebook overestimated the amount of time viewers spent watching videos by 60% to 80%. This overinflation could have led advertisers to believe their videos were getting more views than they were, possibly resulting in increased ad spend, or at the very least, maintaining their current spend. There’s no record of YouTube ever being accused of a similar problem. Google even announced expanded auditing of YouTube metrics provided to advertisers to increase advertisers’ confidence in the numbers provided. It was probably no coincidence this announcement was made around the time Facebook revealed a similar plan in response to the inflation controversy. Is this at least one of the reasons why experienced social media marketers spend more time utilizing YouTube than less-experienced professionals? Do they merely have more confidence in the ability of YouTube to provide them with the metrics that will allow them to accurately measure ROI? According to the 2017 Social Media Marketing Industry Report, 65% of marketers with 3+ years social media experience are interested in YouTube. In fact, Social Media Examiner’s 2017 Social Media Marketing Industry Report found that 65% of the 5,000+ respondents who have been in the industry for more than three years report they’re still interested in utilizing YouTube in their social media marketing plans. 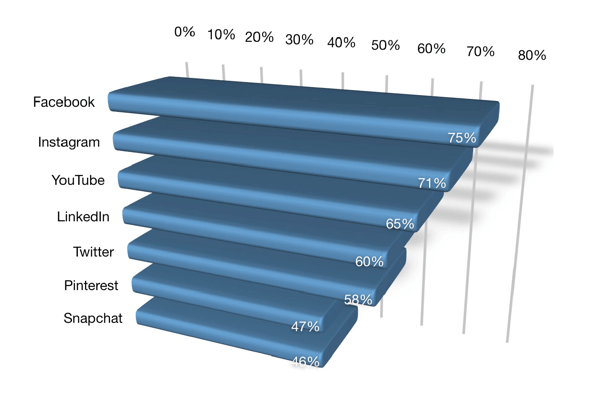 44% of respondents say they plan on either increasing their YouTube ad spend or keeping it the same. Given how dynamic the social media marketing landscape is, it’s no wonder that those professionals who have been in the trenches for a few years are tuned into the importance of being able to accurately measure (and report) the ROI of their social media marketing activities. That’s not to say that Facebook purposely set out to mislead advertisers. The reporting errors could reflect video advertising growing pains. If that’s the case, social media marketers would be wise to closely track the metrics they’re given after Facebook settles the mid-roll vs. pre-roll ad issue. Video ads are new territory for the social media giant, but hopefully they learned their lesson the first time. Experienced social media marketers still consider YouTube a viable advertising option. However, marketers need to keep a keen eye on what’s transpiring with Facebook’s video advertising offerings. Although YouTube has Google behind it, Facebook is a giant unto itself and is known for quickly and completely taking over the social marketing landscape. What do you think? How does this research impact your thinking about marketing on YouTube? What experience do you have with pre-roll versus mid-roll ads? Please share your thoughts in the comments.